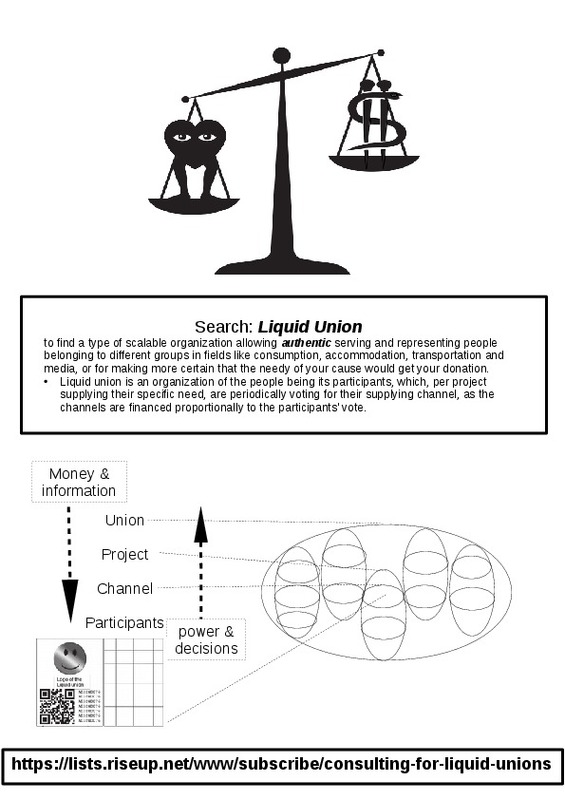 Liquid Union, of which participants, are regularly choosing, by their (prepay) personal union card, one of the existing, or new, project’s branch, being financed proportionally to their amount in the branches, is a new Progressive, Democratic, White-Labeled, Fair-Distributor form of Grassroots Organization to build your Critical Mass, while joining small groups when supplying their needs and as a type of Federal Organization, such as State or Union, like USA, Eu etc. From here you can scale up your social group organizations in a fair, participative and dynamic distribution, by non representative and non hierarchical model of your organization. 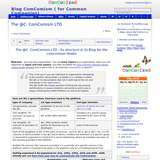 the participants, are regularly choosing, by their (prepay) personal union card, one of the existing, or new, project’s branch being financed proportionally to their amount in the branches. and where the union's member must also be its participant and any of its participants, when want, but after completing the member’s obligations, can become its member and the members’ vote, without the participants, can only be after all participants are notified fairly in advance and only for dissolving the liquid union/its-project or starting impeachment process against the personals of its committees. A scalable solution of fair distribution insuring the delivery of resources to their recipients for diverse populations, while keeping unchanged the personalities of individuals and the identities and habits of the small groups constituting that populations, when each group gets its proportional part, but non “takes it all” and when each individual has the power, versus that group, to move the budget used upon her/his name. Solving the problems of misrepresentation, when trust is breaking, especially when the majority in such society has only void representation, being of all opposing voters plus all abstentions from that voting. From the society respective, good for for integration without assimilation, while making legal bodies working for the society, as opposed to the current situation of societies working for the huge corporates while increasing the influence of big money in elections while inbetween the elections by their lobbies, making democracies become not of the people but of the money (an extreme example - one dollar as one vote in the USA democracy of dollars). good for startups in various fields sympathizing with the democratic economy approach, when are contracting with the projects, to bridge over the middleman, while reducing the price gap toward the customers, as the participants may participate in some projects per each of the fields to avoid project’s monopolizing of such field - fields such as of consumption, housing, transport, communications/media education etc, eg: in the consumption field – projects of the direct marketing to consumers from farmers/producers/creators/importers. A: Any person can invite (3, in the case of ngo,) other people to form together their body of trusts as members of their Syndicate legal body, together having only same vote, while together forming a majority between the members of that Syndicate of a liquid unions networking body. 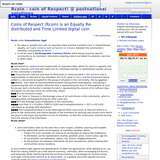 where reasonable compensation for such service is permissible if the bylaws allow and if safeguards are in place to make sure that compensation is fair and in line with what similar organizations provide. D: The mediators of such networking bodies can become also an address for connecting such networking bodies and for accessing donations and/or investments, while creating the required (business) plans. E: When the branches are contracted small business surviving the too big to fail corporations, the participants of such liquid unions could also become partners under this comcomized agreement, in creating their liquid union having 51% and their comcomized unit having 49% in some ownership over the (parts of ) the branches. F: When projects are supplying the (social) media need, the participants can build their political agenda matching their need including govcomcom restructuring . Why getting organized in liquid unions is urgent? Nowadays and globally, we passively live in addictive, monopolistic, more secluded and huge societies, which are controlling huge budgets, while harassing its majority being only Void represented, which are sick and biased by corruption and which produces addictive and monopolistic products, such as weapons and drugs, together with addictive services, such as by the 5 FAAMG (Facebook, Amazon, Apple, Microsoft, and Google) - to make us confused, dependent, socially isolated and politically passive in disintegrating democracies, which are easily being manipulated by making very specific population to not to vote - for example see the Cambridge Analytica scandal affecting 200 democracies. 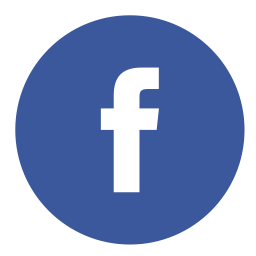 Join us by creating your personal page and/or just view the interactions in this platform by following its rss feeds , forum discussions, mailing list and please contact us, we are creating some more tools around the use in this platform including iiaom. 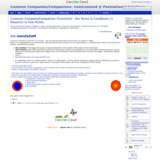 here we develop the Qdolphin qml browser which will translate the rss produced in this site. Digital projects to assist participants, each Liquid Union and connecting them. This includes integrated packages tools of liquid union personal cards, transactions, projects management, voting, debating, proposing and other democratic tools based on blockchain and other protocols and visualization such as for this "Platform". More democratic economy reducing the chances for corruption or monopolization, while increasing self esteem of clients, citizens or donees, by their participation, when creating their critical mass made of small groups maintaining their habit and identities, as the individuals participants identity is based on their activities not only origin. Hence, its market and competition is that of all the existing legal bodies and its benefits are shiner as bigger is the organization. White Labeling - the opportunity to invite the whole groups as they are under their own label, when keeping the identity of groups while strengthen the diversity the project, example by white labeling pro Democratic-Economic artist and politicians and media creators. to donors and donee ..
To supply your needs, become a liquid union's participant, then specify your branch using, in your name, your organization's resources, introduce such organization or choose its personals, principles and projects, as each project is defined by specific budget supplying specific need for specific population. This way, different groups, without losing their identities, could build their critical mass, while, minorities, not like in representative democracy, are able to be financed and individuals are able to move between groups without losing their organization membership. We live in In Representative, but Non representing, Democracies - the problem and solution. 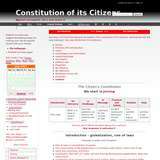 .This is the 1st step in the postnational solutions, see also our starting-up and this site:. 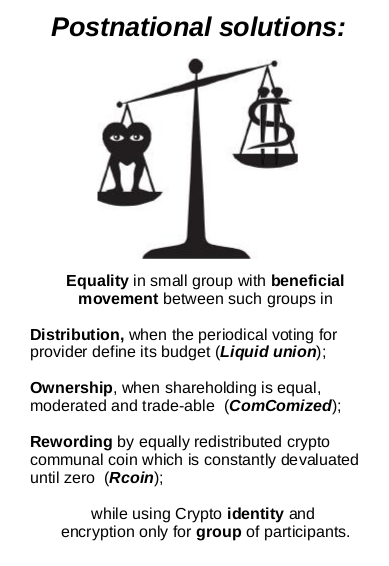 Liquid union defined here is an organization of the people being its participants, which, per project supplying their specific need, are periodically voting for their supplying branch, as the branches are financed proportionally to the participants' vote. 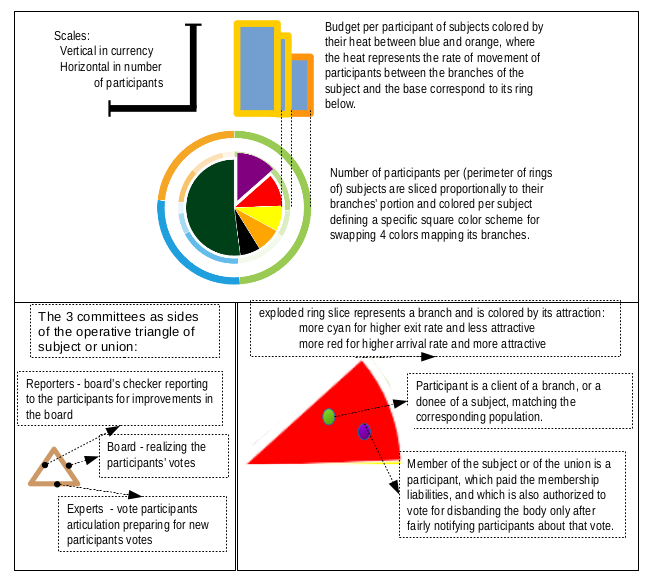 It is made to harmonize, decentralize and empower its participants while reflecting their will (not only choice from limited choices given by some power/elite), such that, the power over the money flow is back under the control of the participants (and not of their representative and bureaucrats), while the participants can move between the branches without losing their union privileges, while split and gathered groups can still maintain their critical mass to achieve their needs and while each group wins its proportional part but never a "Winner Takes All". This type of organization provides a scalable platform, which can be developed bottom up in authentic and fair way, while creating the critical mass which is so necessary for achieving the needs of the participants. Initiation phase by #Artists4SocialImprovement: Artists For Social Improvement, would you let your audience to tell their experience-of, or desire-for, being equal-in group or moving between groups before signing to their liquid union? if so, would you also let the half of the return from such artistic events be given as a donation for assisting in establishing the liquid union and its comcom registration for its participants until having its professional being hired as its officials? if so, contact us please. When the members of this list find their partners to agree with on the terms specified here, they can have their liquid union consultancy an open common company of which d is changeable, as newcomer is invited by 2 members. 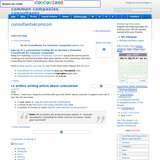 Examples: comcomist ltd. Participate in this discussion group for to become a Participate in existing or new Liquid Union and/or for to share it in your art. Liquid union can create a network that will reward its players for lowering the price gap graph showing the price vs the buyers.